This Decorative Tomahawk Pipe is a combination of an Indian braves fighting axe and a shamanistic smoking pipe. Together with its pipe adornments and its decorative blade, this axe can be a point of pride for its owner. This axe has a distinctive and almost pseudo-modern Native American feel to it, possessing a wooden haft that has been decorated with antiqued brass sunburst studs down its length. This tomahawk also features a decorative, fur-wrapped grip with leather bands that have been set with matching antique brass studs. This tomahawks axe-head is traditional, possessing a narrow blade that has been engraved with an Indian chiefs silhouette, while the reverse of the axe-blade features a stainless steel pipe bowl. Wrapped around the haft is a decorative feather strap, while the end of the haft features a working pipe mouthpiece. 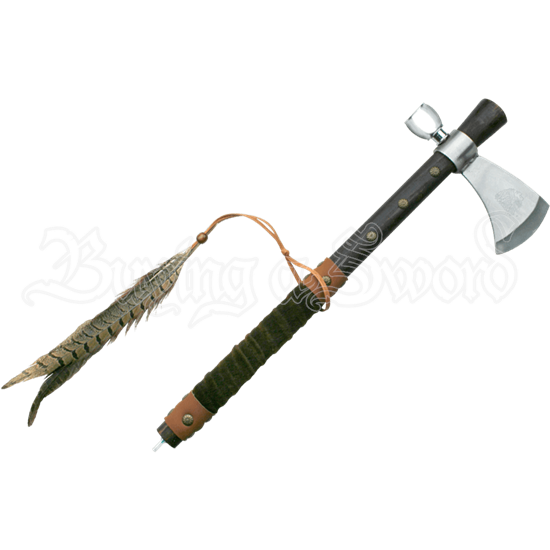 This Tomahawk has an overall length of 18.5 inches, while the blade has a bit-length of only 3 inches. While it almost looks as though it could be a functional weapon, a tomahawk like this Traditional Tomahawk Pipe would have been more ceremonial, wielded only in dances and used to celebrate, making it a great choice for reenactors who want a good axe to wave around, as well as for history and weapon aficionados who have been looking for that intriguing new piece to add to their collection.